Adoptable Storage is a feature introduced with Android 6.0 (Marshmallow). It allows a phone to effectively turn a microSD card into its own internal storage. Some brands still allow Adoptable Storage in their stock ROMs, but Samsung is not one of them. However, it now seems that it is coming back in future updates that involve Pie (9.0). 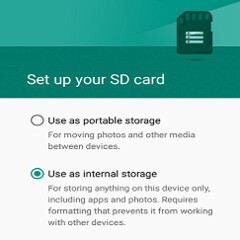 Adoptable Storage was originally baked into Android 6.0 (Marshmallow) so that a device could format a microSD card and 'lock' it to its own use as further internal storage. It may have been a boon for people with low-ROM phones that had expandable memory. However, Google has never been a fan of external memory, and persists in lacking support for it in its own hardware. This may be why Samsung does not typically support Adoptable Storage in most phones running OS versions based on newer versions of Android. However, a report from Gizchina claims that the feature will be included in the upcoming update to Samsung Experience UI based on Pie (9.0). On the other hand, the phones most likely to receive this (e.g. the Galaxy S9 and Note 9 lines) often comfortably match 128GB in internal memory. Therefore, the feature may not be that popular. Those users who rock flagships with less free space (and those with older or mid-tier Samsung phones in line for Pie in the near future) may appreciate Adoptable Storage support more, though. In addition, it may keep interest in Samsung's own microSD cards going, especially in a world increasingly reliant on cloud and fixed flash storage.